This two-tone take on the love knot is a welcome and meaningful addition to any jewelry collection. The three interlocking loops of this 14K gold design are permanently linked, a symbol of the indestructible bond that results when two people are brought together by a force greater than themselves. Two golden rings are accented by a single white gold arc, creating a look that adds extra oomph to this centuries-old Celtic motif and that places extra emphasis on what it represents. With classic styling and a size that's able to accent any look without screaming for attention, these earrings will become fast favorites. Earrings are 7mm and have standard push back posts. 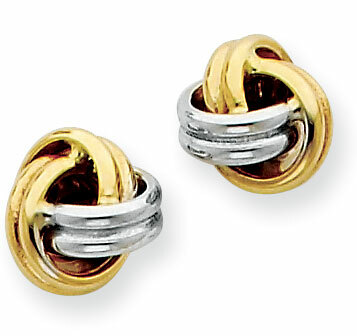 We guarantee our 14K Two Tone Love Knot Earrings to be high quality, authentic jewelry, as described above.